Disarms, to Hit or Not to Hit? 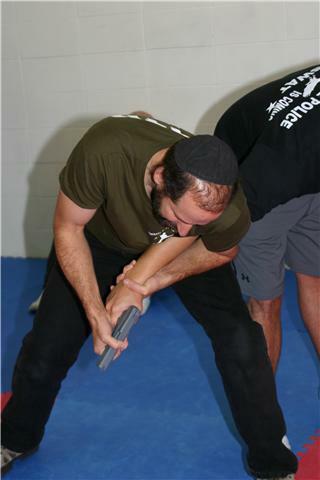 In many popular styles of Krav Maga and other off shoots of the Israeli self defense art, we see, with both gun and knife disarms, the following situation; the defender blocks or grabs the weapon and then hits the attacker in the head. OK, let me clarify. In some cases as we block or grab we also strike. This is in cases when it is natural to do so (difficult to put this into words), but we never grab, and then strike. In other styles I see this all the time and it just drives me crazy. The guy blocks and grabs an arm (we do not grab in this case as it is extremely difficult to do so), and then as he is holding the attackers' arm he is striking the attacker with his free hand. I have been asked "Why are you not hitting the man?" Here is my answer. It is a very simple answer and one born out of real life experience. A human being can absorb a great deal of pain. How much pain is necessary for someone to comply? There is no answer to that. I have heard stories about people who were very badly beaten by cops or soldiers and still did not submit. I have heard stories about people being hit with batons and told to sit, but they did not sit until someone shot them in the knees. I have heard stories about people receiving repeated blows to the head, yet not submitting. The point is you can never count on pain to force someone to comply. So now think logically. A guy is pointing a gun at your head; the greatest threat to your well being is that gun. Yet, of the two hands you have you only devote one of them to grabbing this life threatening gun, the other hand you use to hit the guy. Why are you hitting him? What movie are you living in? Do you really believe that one blow to the head will cause him to let go of his precious gun? No way! What he will be doing is using all his might to pull that gun away from you and shoot you. Yet you have decided to hold his gun hand with only one of your hands. One hand! Are you really that powerful? Are you the Hulk? What I believe is you need to grab him with both hands, but not only both hands, you need to throw your entire body weight into this. Only this way do you have a chance of taking that gun away. To fully explain this of course requires some visual but I hope the martial artists reading this understand what I am saying. I simply do not understand the logic of using only one hand against the main threat. I can only assume that these practitioners have not fully tested these techniques in realistic training. Train hard, train real, stay alive my friends. I get asked all the time about the questionable technique to which you refer in this blog. I have always replied similarly, but from the cop point of view. I can't help it, this line of work just seems to permeate your entire personality after a while, and I've done this my entire adult life! Anyway, I'd like to run the one distinct part I use by all of you and see what you think..... Criminals are, all in all, not powerful people. They don't hold jobs which give them authority over others, they don't have legitimate creative outlets, and they sure don't have any moral compass guiding them. These however, are things they greatly want - most of the time. Many of them don't feel capable of getting them and it's someone else's fault! They aren't willing to take personal responsibility for their lives going the wrong way. As they become more seasoned, or in my opinion prison hardened, they hone their craft like anyone else, always looking to get better. When they eventually graduate to using a gun, it is the point of their power. It's the reason they feel capable of robbing a bank in broad daylight; when they started out robbing convenience stores at 2AM. They've grown, evolved, become "more powerful". By the time they are willing and able to take things up close and personal, the gun is as much a part of them as a baseball bat and glove is to the professional player. They "need" it to complete their job. It's become not only a part of the gig, but of their sense of identity and authority. The power they've been looking for all this time. Is this a conscious act? Do they think this through with much soul searching and psychological profiling? Of course not, but under the surface, some measure of this exists. So the last thing they are willing to lose sight of, the last thing they are willing to part with, the last thing they will let you have control of is that GUN! It's what makes them brave enough to pull off this act of violence, it's the culmination and object of their one hope of succeeding in this crime. Without a whole lot of "luck" or some divine intervention, there is no way a strike to the face or even the throat will be enough to keep them from fighting back and trying to regain control of the weapon! Okay, so perhaps not every criminal is this complex, but the worst of them are. Those career criminals who were essentially raised in institutions and matured as "adults" inside a corrections facility of some sort. Those who have been mentored by evil persons who started out just like them, raised by the state and baby-sitted by law enforcement! In my shop, I am always yelling something to my students during high stress training: "in here you must 'overtrain' so out there you don't 'under-perform'!!". My goal is to help them realize they must prepare for the worst case scenarios and be creative when mentally preparing for those situations. This may be the only chance they have to get ready for the people in the paragraph above. 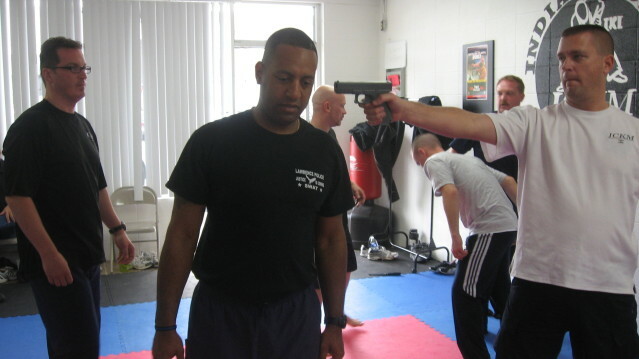 Response Team Member, Detention Lead Defensive Tactics Officer, Training Coordinator, Sheriff's Dept. Arizona. Regardless of whether one uses simultaneous counter attacks with redirection or not dealing with a gun wielding attacker is a gamble! I think on this we can all agree, yes or no? Then why would I risk the possibility of turn any part of the odds against me. Where my life is in danger, I owe it to myself and those who love me to put every effort into getting home safe. By using s single hand to grab a metal object and then putting force into the one holding the object will likely drive that object backwards, correct? If that object holding the metal object is say 175 pounds and I have added inertia to that 175 pound object, is my one hand going to be strong enough to keep a grip on the metal object? Will I be fast enough to react to the backwards inertia to keep the gun redirected in a same muzzle direction? Can I do all of this while under the largest adrenal dump of my life and still be coherent enough to pull off a disarm at waist high? These are all things which erode the odds which could be in my favor. Ad things like exhaustion, sweaty hands, carrying something and the odds just drop even more because I am trying to multi-task in a life threatening situation. Put it all logically and you see how this adds up against a person being able to pull off much more than a whole body skill and therefore the only hope of success in REAL LIFE is in focusing on a fast and powerful disarm which uses gross motor skills. I mean no disrespect to anyone, but the IKMF method is dangerous in real life. As a tactical operator I would never put myself or team mates in danger by using those methods.